The AUD/USD currency pair soared on Friday afternoon to hit new 2-month highs of 0.7185 as traders continued to express optimism with all eyes set on China’s trade balance data. The pair bounced off weekly lows of about 0.7115 to trade at a new six-week high of 0.7185 despite the Reserve Bank of Australia’s weak inflation data reported on the previous day. 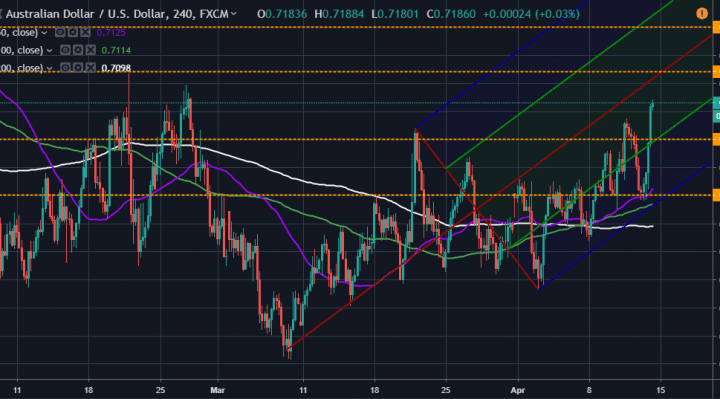 From a fundamental perspective, the AUD/USD currency pair’s current rally appears to be driven by today’s China trade data, which beat expectations thereby pointing towards an improvement in the Chinese economy. China’s exports for March beat expectations with USD-denominated exports rising by 14.2% compared to the forecasted figure of just 7.3%. On the other hand, USD-denominated imports for March were down 7.6% from a year ago, analysts had estimated a decline of 1.3%. This provided China with a March 2019 trade surplus of well over $32 billion compared to Dow Jones estimate of $6 billion surplus and Reuters estimate of $7.05 billion. And China, being Australia’s number 1 customer, the Aussie benefited from the positive trade balance data from Asian superpower. Technically, the AUD/USD currency pair’s current bullish movement appears to be oscillating within an upward trending channel, which is better illustrated using Andrews pitchfork. The pair is currently pegged down to the lower end of the pitchfork just below the median line. It spent the second half of the month of March on the upper side of the median line. This scenario provides interesting opportunities for the bulls and the bears. The bulls will target profits at around 0.7200 while the bears will look to pounce for opportunities at around 0.7160 in the short-term should the pair pull back. The daily chart gives us a long-term perspective of how things could pan out. And currently, it looks like there is a short-term consolidation forming, which could lead to a breakout. 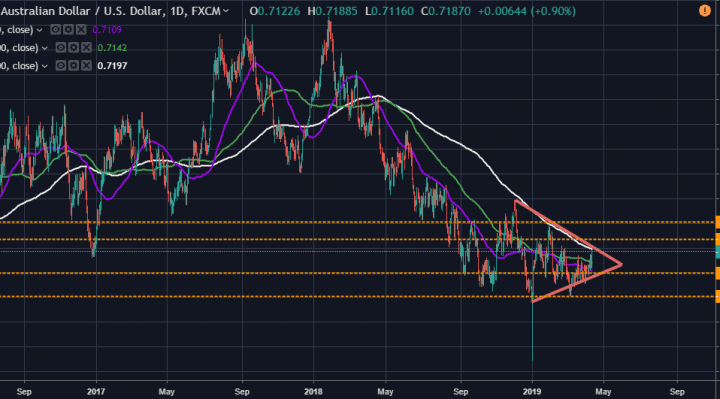 The AUD/USD currency pair is tightly pegged within the 50-day and the 200-day moving averages, and it currently appears to be forming a symmetrical triangle. Again, both the bulls and the bears will be buoyed by the current scenario with the pair creating multiple trading opportunities. In summary, the AUD/USD currency pair rebounded on Friday to hit a new 2-month high. The bears will be looking forward to an immediate pullback while the bulls will look to maintain their short-term control.